Using a plastic disposable pipette, transfer a few dozen, undamaged, healthy worms into the aquarium. Never attempt to handle or transfer worms with forceps or hooks; they are easily injured by these instruments. Next, add enough strips of brown paper towel to just cover the bottom of the container. The towel serves as a fibrous substrate of decomposing material, both for the worms and for numerous microscopic organisms that may inhabit the culture, such as bacteria, protozoans, rotifers, and ostracods. Sinking fish food pellets (or Spirulina or Spirulina chips) may be used as the primary food source for this simple aquatic ecosystem. Start by adding one or two small pellet fragments. After a few days, additional food may be added, but only if the others has been consumed. Do not overfeed, since decomposition of uneaten food may contaminate the aquarium and cause a mass die-off of worms. Worms will not be harmed, however, by irregular feeding or weeks of starvation as long as culture water is not foul. 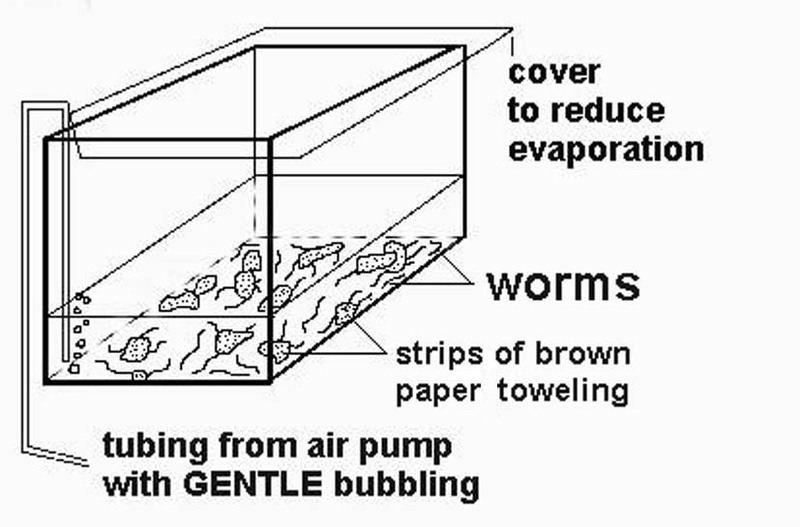 Continuous, gentle aeration is recommended, and this becomes increasingly important as biological decomposition of the paper occurs and as the worm population increases. Water lost to evaporation is simply replaced by adding spring (or distilled) water. As the paper towel disintegrates and waste residues accumulate, the culture water should be regularly replaced (about every two weeks). Do this by slowing decanting the culture water down a drain, being careful not to pour out the paper and worms that remain at the bottom. After rinsing the paper and worms again with spring water and decanting, the aquarium should be refilled with spring water to the original level and new pieces of towel added. Occasional harvesting of surplus worms is advised; these can be used for classroom experiments, as live food for fish, or for starting duplicate cultures. Maintenance of at least one duplicate culture is strongly suggested. Under these laboratory conditions, worms will reproduce continuously by asexual reproduction (fragmentation) and cultures may be sustained for years. NOTE: Depending on shipping conditions, when a container of worms arrives it may contain a mixed quantity of living and dead worms, a situation that requires immediate attention and care. If some worms are dead or decaying, the container will have an unpleasant odor. In this case, the container contents should immediately be transferred into a large volume (gallon) of clean spring water. Then, while viewing the worms against a light-colored background, remove and discard all worms that appear damaged or necrotic. Aeration, and at least one change of water, are strongly advised. To establish long-term lab cultures, subdivide worms into several large-volume containers to create replicate cultures.